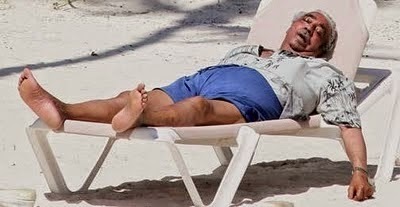 Charlie Rangel has a message for members of the Tea Party. Rangel didn't mean anything bad when he called tea partiers "white crackers," he meant it as a complement. Personally I am glad he said that because every time I called him a corrupt politician it was meant as a complement because he is so good at it. That’s how Mr. Rangel explained away his widely criticized 2013 reference to the group during an interview with The Huffington Post in which he also seemed to suggest that tea party members were of the same vein as terrorists. Mr. Rangel was first confronted with his 2013 statement, when he likened the tea party to the “same group we faced in the South, with the white crackers, the dogs and the police,” the video showed. He then responded: “I thought that was a term of endearment. They’re so proud of their heritage and all the things they believe [the tea party] … I can tell you this. With all of the feelings I have against these people who have been against justice, fair play, equality, and the freedoms as we know it, if I offended them by calling them a white cracker, for that I apologize. For the rest of it, there’s a lot that has to be done here,” he said, on the video. Mr. Rangel then dug in to his stance a bit more, seeming to suggest that those who criticized his reference to the tea party as a grouping of white crackers were out of line — and also seeming to suggest that tea party members were of the same ilk as terrorists. 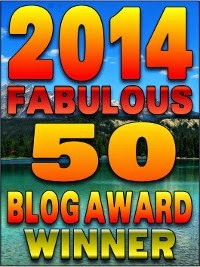 “With the names I’ve been called, I’ve never really put cracker in that category. I certainly would like to have dinner with some of the people who were offended,” he said, on the video. Cool Charlie, I will go out to dinner with you...why don't you take me down to the resort property you didn't pay taxes for a couple of years? maybe we can order in Kosher Chinese. He was discovered taking a tax break for people whose primary residence was in Washington DC, but if his primary residence was in DC he couldn't be congressman representing NYC. And besides, he was occupying four rent controlled apartments in New York; the rule is you don't qualify for rent control unless the apartment is your primary residence. That is why he got in trouble for using one of the apartments as his office. There was the $1.95 million, federal earmark funded Charles B. Rangel Center for Public Service this one was legal but just as smelly. He misused his congressional office to fund raise for his private Rangel Center by preserving a tax loophole for an oil drilling company in exchange for a donation to his vanity Charles B. Rangel center. Then there was the investigation of the NY Congressman, revolving around a Caribbean boondoggle. Once the ethics investigation began Rangel gave campaign donations to 119 members of Congress, including three of the five Democrats on the House Ethics Committee who are charged with investigating him. The 84-year-old New York Democrat joined a 10-lawmaker delegation from the Congressional Black Caucus for a week-long China trip last August. Seven of the other lawmakers on the trip listed it on their annual financial-disclosure forms, made public earlier this month. The two other attendees, Reps. Gregory Meeks and Sheila Jackson Lee, have not yet filed their reports, after asking for extensions. Only Rangel has failed to report the trip. Rangel spokeswoman Hannah Kim said Rangel asked his accountants to immediately amend his financial disclosure form to report the trip after National Journal first reported his failure to report the trip Thursday. 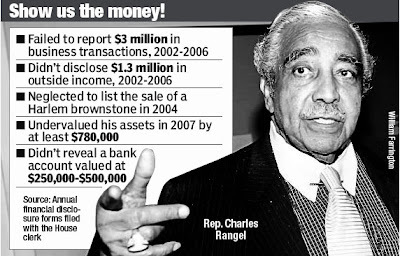 Of course Rep. Rangel, it was all a mistake--once you got caught. 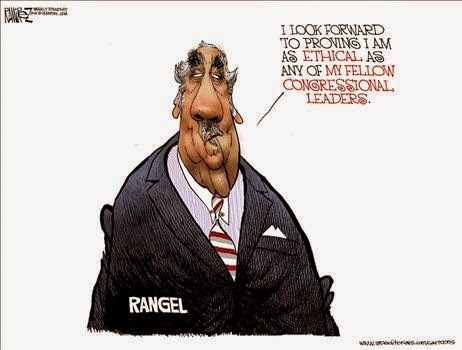 Let's not forget that Rangel was censured on the House floor in December 2010 after the ethics panel found him guilty of 11 charges related to his conduct outside the Capitol. The vote against him was a bi-partisan 333-79. Why don't you have your "people" call me to set up dinner? I promise to complement you the entire time by calling you corrupt.